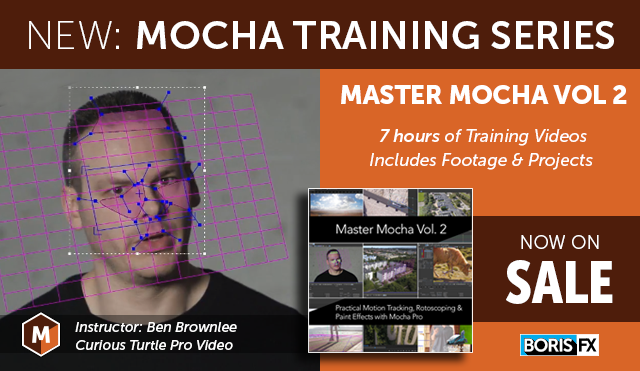 Popular Mocha trainer and VFX artist, Ben Brownlee, is back with a fresh new course featuring the most recent Mocha interface and features. Gain access to 7 hours of practical problem-solving tutorials to help you conquer everyday to advanced VFX challenges. Perfect for beginners through intermediate Mocha users. Master Mocha, Volume 2 is available as an instant download. Includes all footage and projects to follow along. Limited-time discount offer. Ends Thursday, February 22, 2018 at midnight. And lots more! Find full details here. About the presenter: Ben Brownlee has worked in production and post-production since 1999. In that time he has worked on a wide variety of film, television and commercial projects. As a trainer, he has worked with leading broadcasters and post-houses across the globe, providing bespoke training courses. He has also developed courses for renowned training providers such as Lynda.com and fxphd.com. Visit Curious Turtle training. Ben will be a special guest demo artist at the Boris FX booth at NAB (April 9-12, 2018) in Las Vegas.